UNC Lineberger’s Deborah K. Mayer, PhD, RN, AOCN, FAAN, has been appointed interim director of the National Cancer Institute’s Office of Cancer Survivorship. 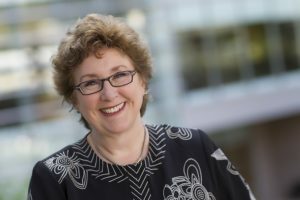 Deborah K. Mayer, PhD, RN, AOCN, FAAN, director of cancer survivorship at the UNC Lineberger Comprehensive Cancer Center and the Frances Hill Fox Distinguished Professor at the UNC School of Nursing, has been appointed interim director of the National Cancer Institute’s Office of Cancer Survivorship. A nationally recognized leader in cancer survivorship, Mayer is an advanced practice oncology nurse with more than 40 years of experience in cancer nursing, education and research. She is a highly sought after lecturer on issues related to oncology and oncology nursing and has published more 150 articles and book chapters. “We are pleased that Dr. Mayer has graciously agreed to serve as interim director of NCI’s Office of Cancer Survivorship. Her expertise will provide strong leadership for a critical component of NCI’s research mission and portfolio,” said Norman E. Sharpless, MD, director of the National Cancer Institute. A recent study estimates there were 15.5 million cancer survivors in the United States in 2016. This figure is expected to increase to 20.3 million in 2026 and 26.1 million in by 2040. Cancer treatment can cause a range of short- and long-term side effects that can affect patients physically, emotionally, socially and economically. Mayer is past president of the Oncology Nursing Society (ONS) and a former member of the National Cancer Institute’s National Cancer Advisory Board and the Board of Scientific Advisors. She is the immediate past president of the American Society of Clinical Oncology Survivorship Committee. The ONS presented Mayer with its Lifetime Achievement Award in 2015, and in 2016, Mayer was appointed as the only nurse to the National Cancer Moonshot Initiative’s Blue Ribbon Panel. Mayer will maintain her appointments and responsibilities at UNC, which includes overseeing a clinical practice working with breast cancer survivors. “This is a wonderful privilege and opportunity to work with some of our brightest minds to better understand and address the needs of cancer survivors,” said Mayer. “While we already have made great strides in enhancing the lives of cancer survivors, there is much more we can do, and it is imperative we do more to help the growing population of cancer survivors.